So proper clothing can make the difference between a wonderful outdoor experience, and the most miserable day of your life, with possibly some consequences on your health. And remember that warm clothing doesn't always mean expensive clothing. Of course, specialized outdoor clothes labels are selling products which have been thoroughly tested and which, if selected wisely, will not disappoint you, but the local farmers, reindeer herders or lumberjacks spend their whole life working outside in Lapland, and they don't wear any super expensive, super technical, expedition clothes. You can be warm without using thousands of euros. Multiple layers (torso and legs) : wear several layers on each other. First layer should be some thin, moisture repellent layer (to take the sweat away from your skin). NEVER use cotton as first layer: it keeps the moisture and will make you feel cold. Then warm layers (fleece or wool) will keep your body warm. Take them big enough, they should not squeeze. (I usually wear 2 layers of fleece, one thin and one zippered thicker fleece, and if it becomes really cold I put a third fleece.) On top of the warm layer, use a wind stopper layer (goretex, cordura, etc... the locals even use cotton anoraks...), and finally I almost always keep a big down jacket in my backpack for extra warmth during breaks or in case of emergency. (those jackets are really light and yet very warm). Since a few years, you can also find thin down feather layers (legs and torso) that you can put under your wind stopper layer. They work very well but can be a little expensive. Extremities (Hands and feet) : It is usually from the feet and/or the hands that we start to feel cold, and the cold feeling then spread to the rest of the body. For the feet, the best is to have thick woollen socks (easy to find and cheap), or then you can use special hiking socks for cold weather. Select big enough socks, so that 2 layers don't start to squeeze your foot and prevent the blood circulation. Too many socks usually affect your blood flow, and make you feel cold. I never use more than 2 pairs of really thick woollen socks (knitted by my mother-in-law). And NEVER use cotton socks, they will make you cold. Until about -15C, you can use good, regular hiking boots, if they don't compress your feet with 2 layers of socks. After that I recommend special shoes for winter/cold regions. The local outdoor companies like Lapland Safaris will borrow you shoes and overall for the duration of your holidays if you book a program with them. Use those shoes if you don't have better ones. My winter shoes are 1 or two size bigger than my summer shoes, so my toes are free to move inside the shoes with 2 pairs of socks. For the hands, mittens work way better than gloves. if you absolutely want to use gloves, just put them, and then, put mittens on them! This is actually what I do all winter long : I have a pair of woollen fingerless gloves, and some thick mittens on those. If I feel too warm, I put my mitts in my backpack or on my snowshoeing sticks. The head : 20% to 30% of the heat loss of the body is coming from the head. Humans lose about as much heat from the head than from the legs...do we walk outside in winter without any trousers? So ... let's wear a hat! And when I say hat, it is not earmuffs, headband, or other fancy stuff : it is just a plain, regular, cheap, thick woollen hat which cover the head and the ears. Beside, good outdoor jacket have a hood. Use the hood as an extra layer. Some locals use 2 hats when it is very cold, it works very well, and nobody can see it. Other use fur hat (chapka). You don't find anything warmer than a real fur hat on this small planet, but if you start to move with them, you will start to sweat in them, and slowly but surely, they will start to smell quite bad, and they are very difficult to wash... I use a fur hat only if it is bloody cold, and if I don't move too much. A scarf is also a very good piece of kit to protect the neck, and cover the cheeks and the mouth if it becomes really windy. Adjust your clothing to your activity level : If you do any physical activity (skiing, snowshoeing) the main idea is to avoid sweating too much. The guide never minds if you take a break to adjust your clothes! If you start to feel warm, take one layer of clothes right away, don't wait until you sweat. And as soon as you take a break, while you still feel warm from the physical activity, put back on the layer you took away. I personally use mostly zippered fleece, so I can adjust my clothing on the go with my backpack on, and if the weather is not windy/snowy, my wind stopper layer stays in my backpack (but I put one more fleece) so that the moisture evaporates faster. Finally, I have this very thick and very warm down jacket in my backpack, that I use only during breaks so it stays dry. If you have more passive activity (ice fishing, reindeer farm visit, northern light watching) just put more warm clothes. 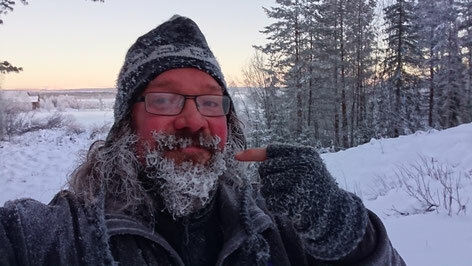 Don't trust the thermometer : -10C ( warm weather for local standards) doesn't feel cold at all after 10min outside, but if you spend 2-3 hours or more without moving, maybe in a windy place, the situation will be different. In this case, those really warm jackets (for example Canadian Goose jackets), or the snowmobile overalls are really useful.